The 100th Bombardment Squadron, Wayne’s squadron, has completed its move from Hollandia to Sansapor. Wayne has returned full-time to flying combat missions. Meanwhile, two of Wayne’s brothers are training for overseas combat duty. His youngest brother is on his way to Camp Van Dorn in Mississippi for advanced infantry training on bazookas, grenades, machine guns, and field artillery. Another brother, Verne, is stationed with the 221st Combat Crew Training School at Alexandria Army Air Base near Alexandria, Louisiana where he is engaged in B-17 combat aircrew training. On September 24, Verne wrote their father with news of the youngest brother and other family matters. Your letter arrived today and is plenty welcome. The money came at an opportune moment but as yet we haven’t figured out why you sent so much. We thought you may have been misled by the way I wrote or something. Nordie has been sent to Camp Van Dorn, Miss. to the 144th Infantry.1 He went through Shreveport, La. last night so I got a twenty-four hour pass and hitch-hiked up to see him.2 We were able to spend a very enjoyable five and a half hours together. He looks good dad and seems to be getting along famously with the army. I tried my best to talk him into taking some Army correspondence courses and get a good education as long as he has this opportunity. For two bucks they send any number of courses a person wishes to take. These courses give you the same credit that schools do and can be used as part of high school or college. I plan on taking three courses on electricity and engineering as soon as I leave this country. I’ve been putting it off until then because with the family it is pretty hard to devote any time elsewhere when they are close to me. I guess Bob is in pretty deep right now. I’ve been expecting it for the past few years. Personally I feel that whatever happens won’t be as bad as everyone expects it to be. Nord said he was in the guardhouse in Tampa. My hope is that they scare him so bad that it will set him on the right path. Bob deserves a lot of the blame for his actions but Guyneth just as much. Has Ethel been able to locate a place as yet. I hope she doesn’t have too much trouble. Aileen wishes to write a little so I’ll close for my part. Little Allen is getting to be quite a boy and misses Verne when he leaves for the field. Verne & I have enclosed a snapshot and hope you like it. 1 Verne’s brother, Harry Nordman Gray, was on his way to report to the 144th Infantry Regiment for advanced infantry and artillery training at Camp Van Dorn, near Centreville, Mississippi. Centreville is located on the border of Wilkinson and Amite Counties about 50 miles north of Baton Rouge, Louisiana. 2 Shreveport is located about 125 miles northwest of Alexandria along US-71. The following web site by Elinor Florence will provide a sense of the ride sharing culture of the time: http://elinorflorence.com/blog/fuel-rations. Construction at Dodge City Army Air Field began on August 6, 1942. Training activities at the air field ceased in June 1945, and by mid-July, Dodge City Army Air Field was closed.
. . . in June 1942 of Dodge City chosen for a field to provide bomber training for the British Royal Air Force (RAF). The site was originally intended as one of the RAF bases planned for western Kansas that also included Garden City, Pratt and Liberal. The RAF did not come to Kansas, but plans for the field continued. Approximately 2,520 acres northwest of Dodge City were acquired from eight property owners through condemnation. An additional 16 acres were purchased for the construction of a railroad spur to the field. Construction began in August 1942, primarily consisting of cantonment, hangars, roads and facilities. Housing was built for nearly 4,000 men, a hospital for 177 beds, warehousing with 71,186 square feet and at least four hangars that had space for 165 airplanes. Four runways 6,500 feet long, six 75-foot taxiways and an apron 600 by 5,300 feet were constructed. Work was complete by December 31, totaling more than $7 million. Dodge City AAF was initially designated as an advanced flying school. This soon changed to pilot training and ground instruction on the B-26 “Marauder” medium bomber. Classes of students also included French nationals and Womens Airforce Service Pilots (WASPs). Susan Jezak Ford. “World War II-Era Aviation Related Facilities of Kansas.” National Register of Historic Places Multiple Property Documentation Form, United States Department of the Interior, approved September 25, 2012. (http://www.kshs.org/resource/national_register/MPS/worldwarIIAirbases_MPDF.pdf : accessed 24 September 2014) p 19. See also: Debra Goodrich Bisel and Michelle M. Martin. Kansas Forts and Bases: Sentinels on the Prairies. Charleston, South Carolina: The History Press, 2013. pp 120–124. 4 Thomas Jason Gray began working in 1910, at the age of 16, with the Western Union Telegraph Company and retired in 1973 at the age of 79 as the Assistant General Manager of Dairyland Power, a Rural Electrification Administration (REA) cooperative, in La Crosse, La Crosse Co., Wisconsin. Prior to World War II, he was the District Manager of the Public Service Company of Colorado’s Northern District. His power line and construction management knowledge was in high demand, and with resolution of his leg problem, he has found another position. Ethel is preparing to join him, and as part of the process, she has to close down their home, store their furniture, etc. 5 Aileen’s cousin, Joseph J. Trostel, will be released from the U.S. Army on September 28, 1944. While serving as a sergeant with the 45th Infantry Division in Italy, he was severely wounded. Years later, one of his cousins would remark that Joe, or “Sonny” as he was known to some, had received “five mortal wounds” and that it was a miracle that he had survived. 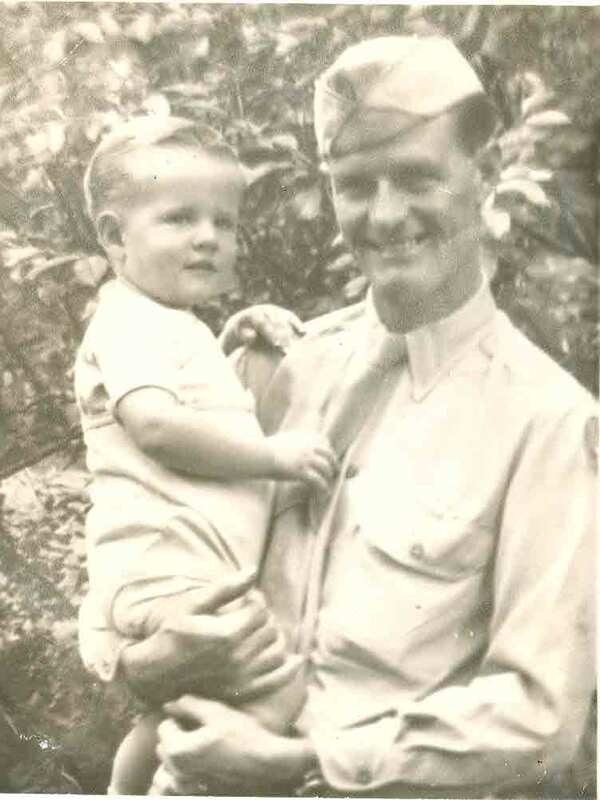 Joseph J. Trostel, United States Army, was awarded the Silver Star for conspicuous gallantry and intrepidity in action against the enemy while serving with the 45th Infantry Division during World War II. General Orders: Headquarters, 45th Infantry Division, General Orders No. 154 (1944). See also Military Times Hall of Valor. (http://projects.militarytimes.com/citations-medals-awards/recipient.php?recipientid=73621 : accessed 23 September 2014) entry for Joseph J. Trostel. This entry was posted in Uncategorized and tagged 114th Infantry Regiment, 45th Infantry Division, B-26, Camp Van Dorn, Centreville, correspondence courses, Dodge City Army Air Field, French, Harry Nordman Gray, hitch-hiked, Italy, Joseph J. Trostel, Louisiana, Mississippi, RAF, Robert Searls Gray, Royal Air Force, Shreveport, Silver Star, Thomas Jason Gray, Verne Richard Gray. Bookmark the permalink. I love the “five mortal wounds” comment. Having an eye-witness view of this war makes all the difference, doesn’t it?